The grounds of the University and adjacent areas provide an environment supporting a diverse range of plants and animals including naturally occurring mosquitoes. High temperatures, rain and tidal variations can create favourable breeding conditions for mosquitoes, particularly on the Crawley campus. Ross River virus is a notifiable disease and the Environmental Health section of the Department of Health, Western Australia monitors these reported cases and advises the community of risks in their area. In the severe mosquito infestation of 2011, the species of mosquito in the Crawley area were not those commonly associated with the virus. A spokesperson for the Department of Health considered the risk of contracting Ross River virus to be very low at the time. Facilities Management Grounds and Maintenance staff actively control potential mosquito breeding sources on the Crawley campus. Storm water drains, dilution pits, ponds, gardens and other potential breeding sources are inspected and appropriate control methods applied if mosquito larvae are detected. The period of this program is from September to May. A qualified pest control contractor sprays locations around the campus as required. While mosquitoes may be evident in internal areas, such as entries and internal air conditioning ducts, the breeding sites are outside. Identification of the source and appropriate controls directed at the source is the emphasis of effective management of mosquitoes. Off campus sources of mosquito breeding are numerous, with marsh and high water areas in the bird sanctuary at Pelican Point and adjacent areas being significant sources. While not under the control of the University, when infestations occur the University communicates with the City of Subiaco and the City of Nedlands who jointly undertake a mosquito management program for their areas. The Cities would also liaise, if required, with the Department of Environment and Conservation who control the bird sanctuary area. For mosquito and other vermin issues staff should contact the Facilities Management Job Controller, preferably by completing an Online Request Form. 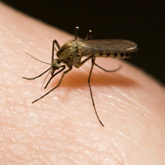 For research involving animals, both protection of the animals from relevant mosquito-borne viruses and protection of the community from animal research into mosquito born viruses needs to be considered in the relevant risk management plan.